In Minnesota, we take our chicken wings very seriously. From pit-smoked chicken in Minneapolis, to dozens of sauce options in Mankato, you’ll find exactly what you’re wing-loving heart desires! Here are the 10 best places to get delicious wings in the state! If you mention wings in Minnesota, someone will eventually bring up Ray J’s. Now with an outpost in Woodbury, Ray J’s is a perennial winner or runner up on just about every “Best of” wings list. In addition to well over a dozen styles and flavors to choose from, this joint is renowned for serving up big, full-sized chicken wings. At Ray J’s, wings are a meal. Lately, it seems Ray J’s fiercest competition for best wings is Smalley’s. This Caribbean-style joint specializes in pimento-wood-smoked, jerk chicken wings. For the Minnesota palate, Smalley’s spice level starts above average and escalates quickly. Their Bourbon Beach jerk wings have award-winning flavor and decent spice. The Triple-6, ghost-pepper-sauced wings, on the other hand, have ruined the evening for many a brave—or foolish—soul. Don’t let the fact that this place is a wing joint fool you: The chef and founder developed the concept after two decades in the fine dining business. As you may guess, their wings are cooked to perfection. The biggest problem you’ll encounter at D-Spot is the overwhelming variety of flavors—literally hundreds—to choose from. Delicious and deadly, their Black Widow wings have won awards and competitions. Generations of Minnesotans have eaten the pit-smoked chicken at Market Bar-B-Que. For the wing version of this delicacy, get the smoked whole wings. 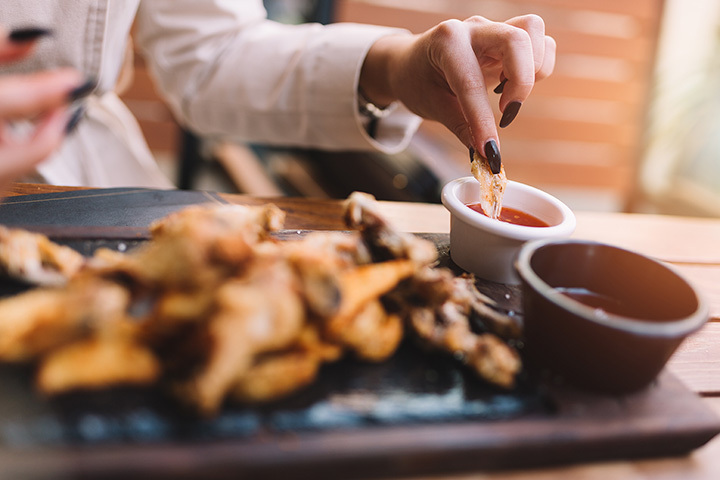 If your looking for something a little more traditional, Market also serves hot Buffalo wings with a kick, and crispy, seasoned chicken wings with hints of cardamom and cinnamon. Lily’s stepped up to rescue St. Cloud from the purgatory of bland, corporate wings. With its brick-and-mortar location and food truck, Lily’s is a purveyor of quality, fresh, locally-sourced product cooked to perfection. Their sauces are all-natural and made in small batches. Lily’s wings, drumsticks, and tenders are hand-spun in the sauce and delivered piping hot. The Rabbit Hole’s “Wangs” are double-fried Korean style and then tossed in owner of their signature sauces. The Kung Pao is nutty and delicious, but if you’re looking for a little heat, get the chile honey lime sauce. It’s just the right sweet-spicy-tangy balance. One of Mankato’s favorite hangouts, Tav on the Ave serves up its jumbo-sized wings in one of more than a dozen sauces. Although you can get them in unnecessary flavors like hotter than hell and three mile island, the sweet Thai chile wings put up just the right combination of flavor and heat to make your lips burn so good. Winona is a college town and a river town. It would be a tragedy for such a community to be deprived of fresh, hand-tossed wings. Fortunately, The Legendary Tavern has stepped into the space and offers up the city’s best variety—more than a dozen—of hand-tossed wing flavors. Located in a former depot on a live railroad, The Railhouse Grille seems to take cues for its wing sauces from the northbound trains that rumble by throughout the day. Southern-style, barbecue, hot, Asian spices—none of these are the natural flavors of small-town Minnesota, even if it’s a small town as scenic as Lake City. The wings are substantial enough at the Railhouse Grill that a half-order and a side salad combine for a tasty meal. The flak we’d get for not including the crisp, spicy wings at Monte Carlo makes them impossible to omit. The Monte has been a Twin Cities institution for decades and their wings a happy hour staple. The spicy-sweet (note the touch of cinnamon) dry wings are big, juicy and delicious. Many folks will tell you they’re hands-down the best wings in Minneapolis. We may not argue.